Stable and unstable manifolds for hyperbolic fixed points and sets have been well studied, see for instance . Pesin developed a general theory of stable and unstable manifolds for diffeomorphisms corresponding to its non-vanishing Lyapunov exponents . His work translated the linear theory of Lyapunov exponents (multiplicative ergodic theorem) into the non-linear theory of stable and unstable invariant manifolds. 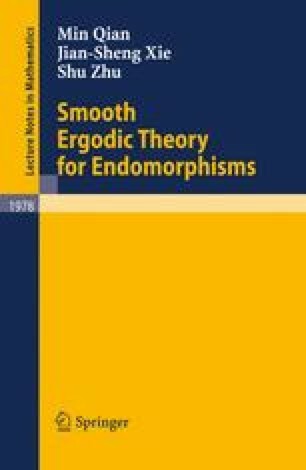 It was demonstrated that this theory provides a fundamental tool for the development of the smooth ergodic theory. Some extensions of Pesin’s result had been given [33, 79], and even in infinite dimensional spaces [56, 80]. More recently, Liu and Qian developed a rigorous theory of stable and unstable manifolds for ran-dom diffeomorphisms . There have been some partial results concerning invariant manifolds for endo-morphisms [69, 83, 80]. However, those results are not enough for the study of smooth ergodic theory of endomorphisms. In order to study the relationship between entropy and Lyapunov exponents, we will need more subtle results. The purpose of this chapter is to an unstable manifold theorem of this kind for non-invertible differentiable maps of finite dimensional manifolds by borrowing the techniques given in . Readers familiar with  can easily see that when the inverse limit space is introduced, some situations are very close to those in . Nevertheless, for the convenience of a larger group of readers who may not wish to involve any randomness, we still give a detailed presentation. The source of this chapter is mainly  except Section 6-9 which follow from [51, Chapter III].